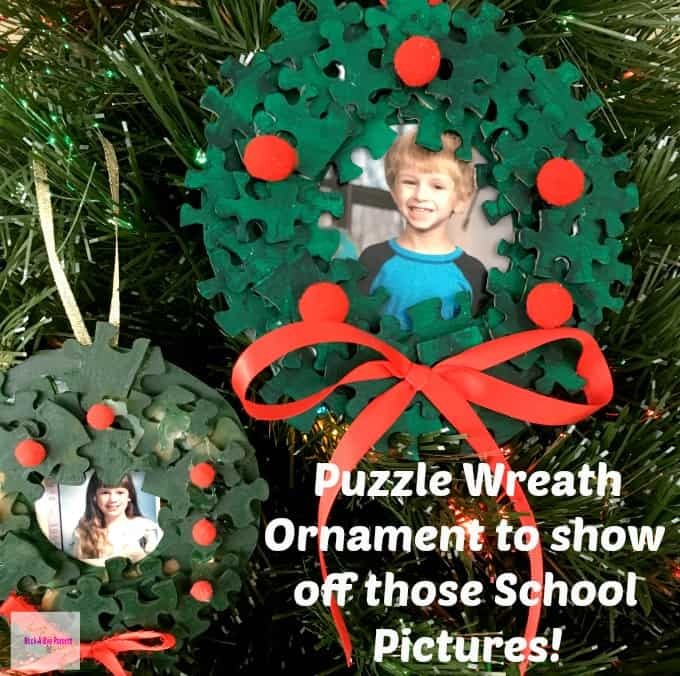 Puzzle Wreath Ornament to Show off those School Pictures! I have to admit that I have a serious love for Christmas ornaments. I love how memories come flooding back as I unpack each one to hang it on the tree. I don’t often buy an ornament just to have an ornament. It has to have some sort of meaning tied to it. Of course some of the ones that really bring memories back are the homemade ones. Especially the ones I made in school that contain school pictures. 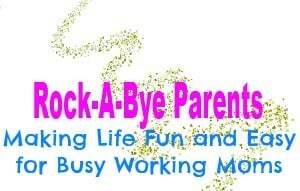 There are several different styles of those. One of my favorites was a puzzle wreath ornament that contained my 5th grade picture. Honestly I don’t remember making this ornament, and I would not have been able to tell you what grade I made it in if the date hadn’t been on the picture. Still, for years I have loved taking it out of the box and hanging it on my mother’s tree. 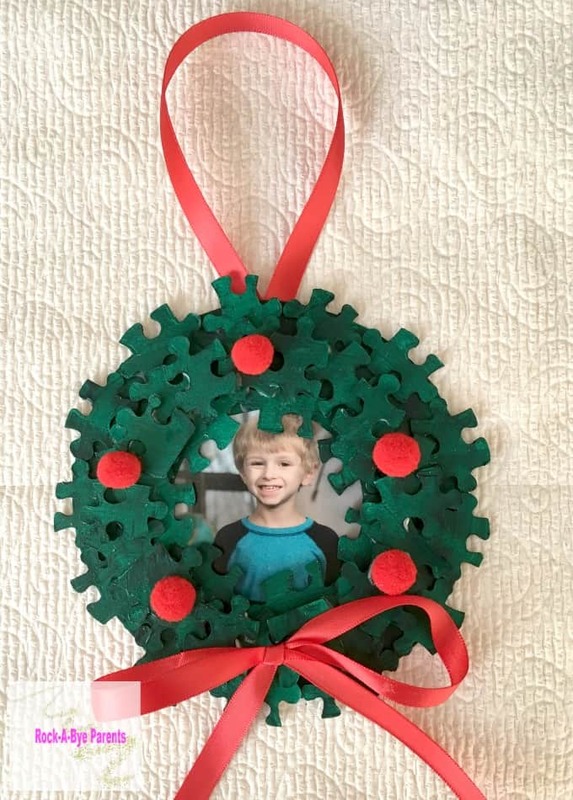 This year, when we were getting all of the ornaments out, I saw my puzzle wreath ornament and thought about how now Nick is in school, and I decided I needed to make a puzzle wreath ornament for him! Nick was very excited about the idea of making a puzzle wreath ornament for him, and he ended up helping quite a bit. The best part was that I got him to help paint the puzzle pieces. Painting is a great way for him to work on improving his hand control. Over the last few months I got him to practice cutting while making his handprint and footprint turkey, he worked on his handwriting with his letter to Santa, and now he has been painting. Not to shabby considering I’ve only been looking for projects for him to do for a few weeks now. Best of all he’s showing improvement in his school work from all the practicing we’ve been doing at home. Now, before I get into the instructions for making the puzzle wreath ornament I want to give a few tips. 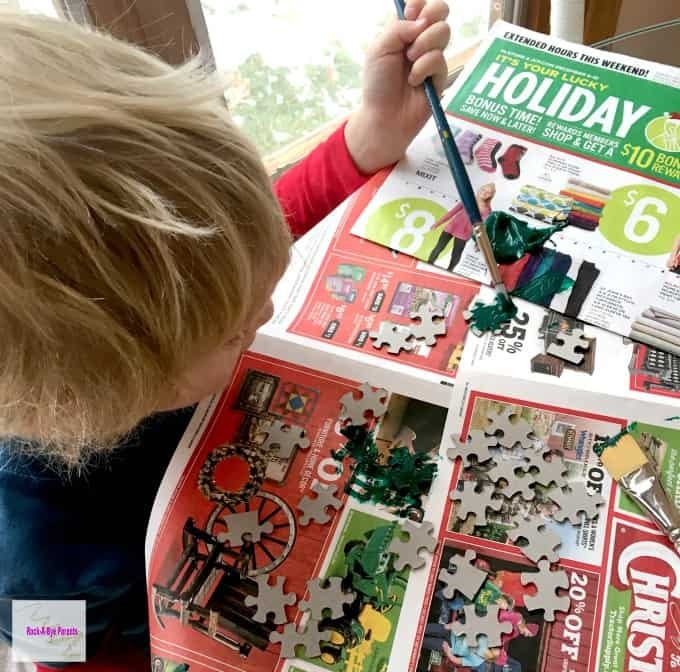 First, we hand painted all of the puzzle pieces, but if you’re going to be doing this with a large group of kids than you might want to consider spray painting the pieces ahead of time. Also, if you plan for this project well in advance you can check garage sales for 1,000 piece puzzles instead of buying a new one like I did. It certainly won’t matter if the puzzle is missing a piece or two! 1. 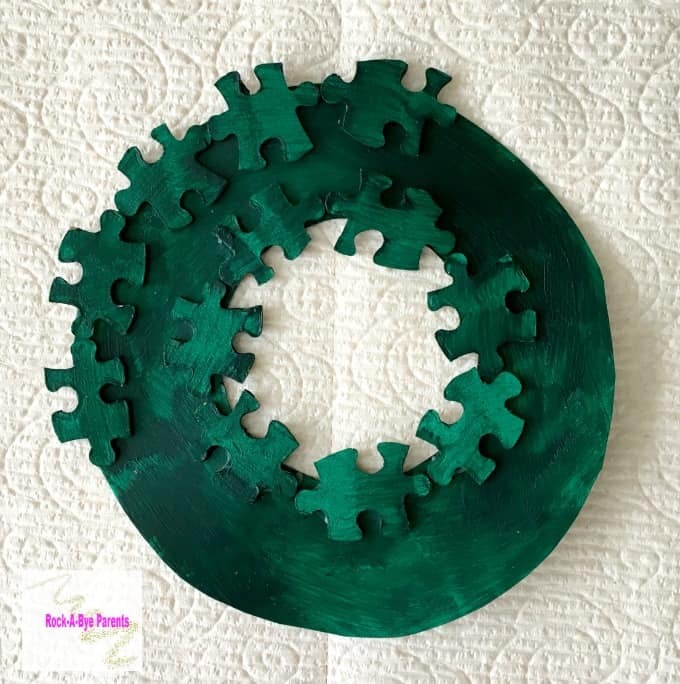 The first thing to do is to paint the puzzle pieces green. 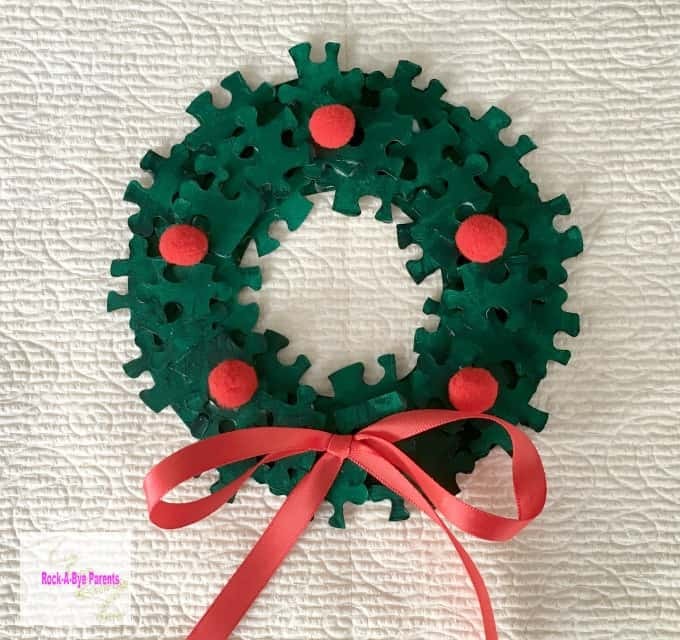 The number of pieces that you need will vary depending on how large you make your wreath and how many layers of puzzle pieces you add. We painted around 50 pieces, but I didn’t end up using all of them (although it was close). My wreath shape ended up being a lot larger than I had planned on though due to Nicks large wallet picture (why are wallets today so big???). Once you paint the pieces set them aside to dry. 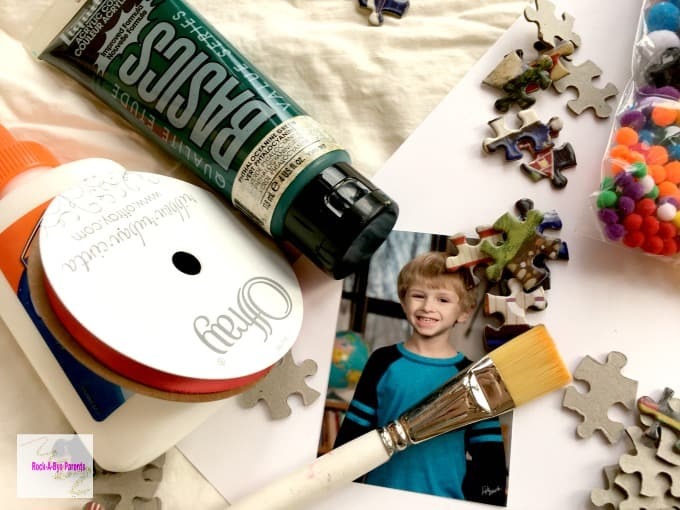 Be aware that while drying the pieces will likely stick to whatever type of paper surface you place them on. Many of ours did, but it was easy to pull any showing newspaper off. 2. 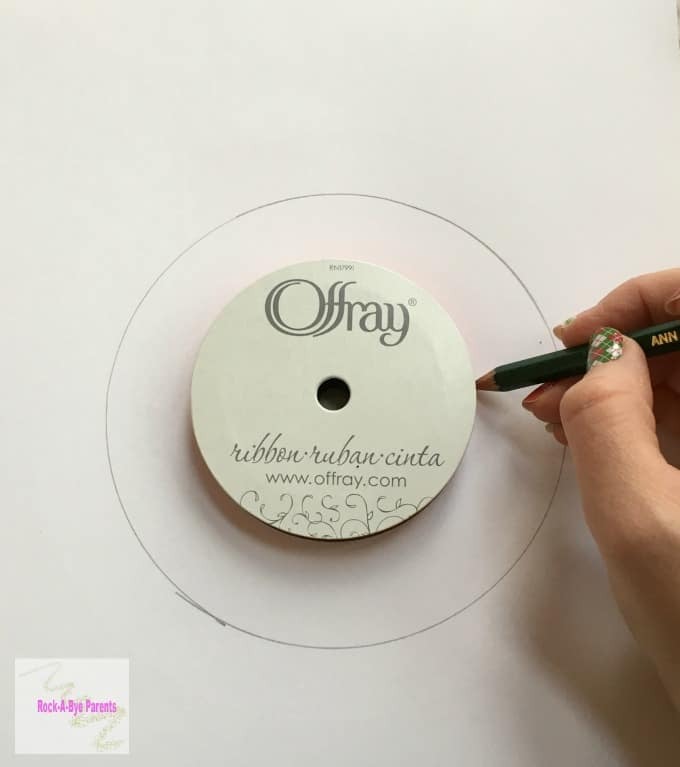 Next create the base of your wreath from the piece of cardstock. To create actual circles I suggest finding circular items around your house, that are the size you want, that you can trace. Once you have it traced and cut out you can paint it green as well. 3. Once the paint on the wreath base and puzzle pieces has dried it’s time to start gluing everything together! How you glue the pieces on is up to you. I felt a need to have an organized system for how I glued the puzzle pieces on to Nick’s wreath, but you can totally glue them on any way you want! All I would say is shoot to have the puzzle pieces be three to four layers deep so you give your puzzle wreath ornament a good depth. The depth really adds to the look of the ornament. Also, don’t skimp on the glue. 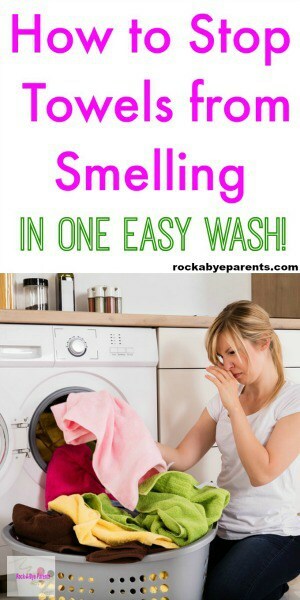 Without enough you may find yourself doing a little regluing. 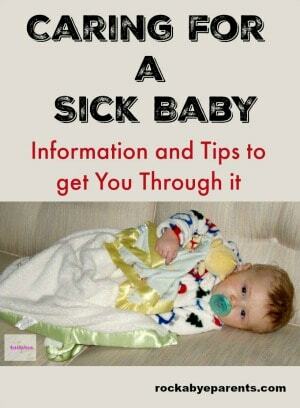 Not that I would know from experience or anything. 4. When you’re happy with the way the puzzle pieces are placed and the glue has dried it is time for the final touches! First, glue on some red pom-poms. Then add a bow at the bottom. As before be sure to use a good amount of glue. 5. To finish the ornament you’ll next attach the picture. Make sure that whatever you attach it with is photo safe. I actually attached Nick’s pictures with photo safe tape. Then attach some ribbon to the back for the ornament to hang from. There you have it! 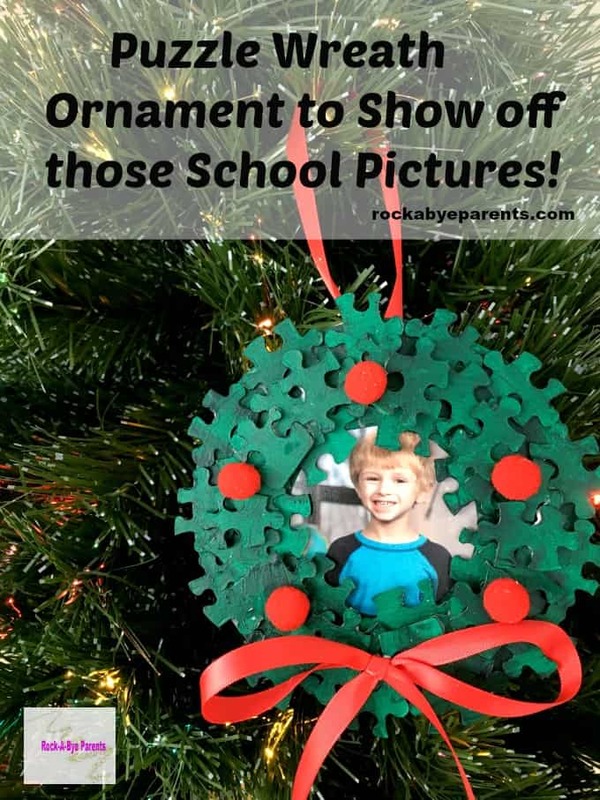 An adorable puzzle wreath ornament that you can use to show off your child’s school picture, or any picture that you want. I have to say that Nick loves his. He can’t stop saying how cute it is. Oh, and just for fun, here’s a comparison of Nick’s puzzle wreath ornament next to mine.